Tina welcomes commissions. No two pieces can be exactly alike, but they can be similar and dissimilar in ways that appeal to you. Pictured on these five pages are examples of pieces Tina was commissioned to make and the originals on which they were based. The king-size headboard on the right above was commissioned by a customer in Texas. 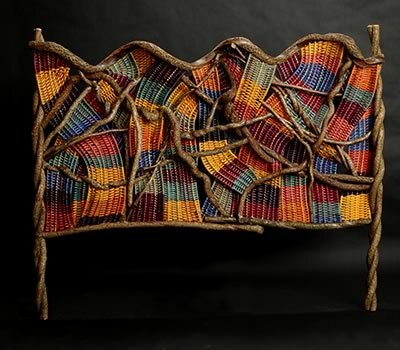 They had seen Tina's queen-size headboard above left and loved the conceptual design, the weaving technique and the colors. They needed a king-size headboard but requested heavier posts. So with the commissioned piece, Tina changed the posts from twisted bittersweet vines to sections of maple tree entwined in curling bittersweet vine. If you see a piece pictured here in Tina's website that you like, whether that piece is available for purchase now or has been sold, Tina will gladly make you a similar piece customized according to your own choice of colors, materials, size and design. 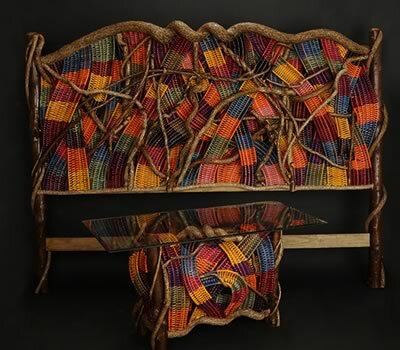 You are invited to browse the product-category sections of Tina's website and imagine the woven work you would like to have. Tina looks forward to making you that piece! To discuss your commissioned piece, please contact Tina now by telephone at (860) 309-6934, or email Tina at Tina@TinasBaskets.com.